Coolgear’s multiport USB Type-C / USB Type-A High powered circuit board is designed for power hungry USB devices that depend on fully charged batteries to operate. Integrate you shell design with this 240W circuit for high power charging. 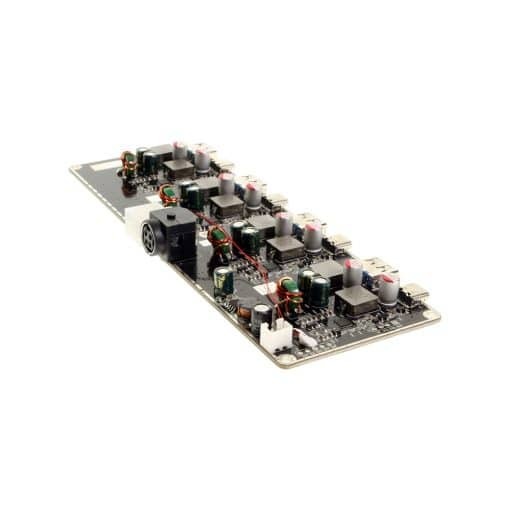 Coolgear Labs 240W circuit board is designed for high power charging integration. Each USB Type-C port has an output of 60W supporting USB-PD applications. It’s wide range of USB power delivery voltages are from 5V to 20V. The USB-C ports voltages are 5/9/12/15/20 and its Type-A ports are QC 3.0 with 15W per port. With Cypress chip control, Power delivery levels of the High Power 240W USB Type-C charging board include 10/15/27/36/45/60W. We have designed this board integration to use Type-C USB PD charging features with high demands in mind, this makes it an EXCELLENT choice for USB-C or A device charging support! Multi port device charging using USB Type-C Power Delivery. Legacy charging features for USB Type-A devices. Can charge HP,Dell,Asus, Apple MacBook or Chromebook equipment. 4x Downstream USB Type-C Power Delivery ports with up to 60W per port. 4x Downstream USB Type-A Legacy Port with QC 3.0/AppleFast Charge supporting up to 15W per port. Supports all USB-PD Power Delivery voltages from 5V to 20V. (5/9/12/15/20) on type C ports and up to 15 Watt per port on type A ports. Supports all USB Power Delivery power levels: 10/15/27/36/45/60W. Variable DC Output as per USB Power Delivery Specification: 5 – 20V at up to 3A per USB port. 240W multiport charging board circuit. optional accessories for the USB PD Integrator Board for 240W Charging – USB C/A Multi-Port Board.